This Bookreporter.com Special Newsletter spotlights a book that we know people will be talking about this spring --- and beyond. 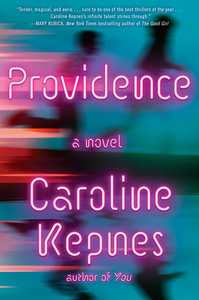 Read more about it, and enter our Spring Preview Contest by Friday, March 30th at 11:59am ET for a chance to win one of five copies of PROVIDENCE by Caroline Kepnes, which releases on June 19th. Please note that each contest is only open for 24 hours, so you will need to act quickly! A journey of two best friends that is part love story, part detective story and part supernatural thriller, from the acclaimed author of YOU, whose work Stephen King describes as "hypnotic and totally original." Growing up as best friends in small-town New Hampshire, Jon and Chloe are the only ones who truly understand each other and their intense connection. But just when Jon is ready to confess the depth of his feelings, he is kidnapped by his substitute teacher, a discredited scientist who is obsessed with H.P. Lovecraft and has a plot to save humanity. After four years in captivity, Jon finally escapes, only to discover that he now has an uncontrollable power that endangers anyone he has intense feelings for. He runs away to Providence to protect Chloe while he searches for answers. Across town from Jon, Detective Charles "Eggs" DeBenedictus is fascinated by a series of strange deaths --- young, healthy people whose hearts just...stop. Convinced these deaths are a series of connected, vigilante killings, he jeopardizes his job and already strained marriage to uncover the truth. With heart, insight and a keen eye on human frailty, Caroline Kepnes whisks us on a journey through New England and crashes these characters' lives together in the most unexpected ways, exploring the complex relationship between the powerful and the powerless, love and identity, self-preservation and self-destruction, and how the lines are often blurred between the two. - Click here to visit Caroline Kepnes' website. - Connect with Caroline Kepnes on Facebook and Twitter.